That concludes our live coverage for today, thanks for staying with us. You can still get all the latest updates on this developing story on the BBC News website. US Secretary of State Mike Pompeo has spoken separately with foreign ministers of India and Pakistan, urging them to avoid "further military activity". "I expressed to both ministers that we encourage India and Pakistan to exercise restraint, and avoid escalation at any cost," Mr Pompeo said. Russia has expressed "serious concern" over the escalation of tensions. Moscow called on both sides to exercise "restraint", adding that existing problems should be solved by "political and diplomatic means". China and the European Union have also made similar comments. It's been very difficult today for everyone, journalists included, to separate fact from fiction. This hasn't been helped by a whirlpool of misinformation on social media. Pakistan's government earlier released footage of the captured Indian fighter pilot on Twitter, with the video being shared far and wide. But several accounts claimed there was also video of a second Indian pilot being captured. A Facebook page circulated this supposed video and it has been shared more than 29,000 times. It has also been retweeted hundreds of times on Twitter. The footage is fake.The original footage of an injured airman was filmed last week when two Indian Air Force (IAF) planes collided in mid-air during a rehearsal for an air show in Bangalore. 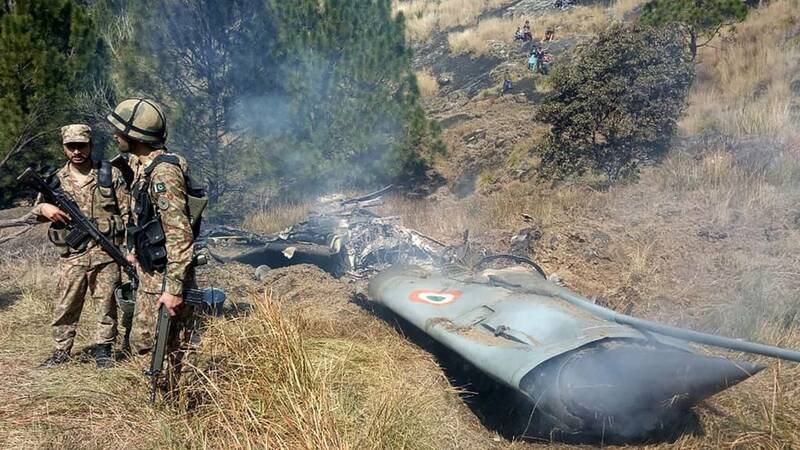 Various Twitter accounts and some Pakistani news sites have also used an image of a crashed IAF jet for their coverage, suggesting the picture was taken on Wednesday in Pakistan-administered Kashmir. But the original picture was actually taken in 2016 when a fighter plane crashed into a building in the Indian city of Jodhpur. In the hours immediately after news of the air clashes broke, other media outlets published old images from a plane crash in India's Orissa state in 2015. They claimed the pictures showed an Indian fighter jet shot down by Pakistani forces. In a separate incident unconnected to the India-Pakistan clashes, India's defence ministry has confirmed that a Mi-17 V5 helicopter belonging to the Indian Air Force crashed near Budgam in Indian-administered Kashmir on Wednesday morning. All six personnel on board were killed. Local media also report that a civilian was killed. India says it has launched an investigation. Images of the helicopter wreckage have been circulating on social media and Pakistan's military earlier said it had nothing to do with it. With tensions high, Indians and Pakistanis have taken to social media, urging their governments to resist military conflict. The hashtag #SayNoToWar is trending worldwide and has been used by citizens on both sides of the border, and by politicians, celebrities and human rights groups. India has demanded the immediate release of its fighter pilot, wing commander Abhinandan, from Pakistani custody. It condemned what it said had been the "vulgar display of an injured personnel of the Indian Air Force" and suggested Pakistan had violated international humanitarian law. The foreign ministry issued a statement shortly after it summoned Pakistan's Deputy High Commissioner Syed Haider Shah, the country's top diplomat in Delhi. It warned Pakistan that it would be "well advised" to ensure that no harm came to the pilot. Both India and Pakistan recalled their ambassadors after the militant attack on 14 February that sparked this crisis. Pakistan's military spokesman Maj Gen Asif Ghafoor has said that only one Indian pilot is in army "custody". His statement comes hours after a press conference when he talked about two Indian pilots being arrested - with one sent to hospital for treatment. No explanation has been given as to why the numbers have changed. India had earlier also said only one of its pilots was "missing", adding that Delhi was investigating Pakistan's claims that he was being held there. Several videos have emerged appearing to show the pilot, including one in which he said he was being looked after "very well" after being rescued from a "mob". Earlier pictures released by Pakistan's government - and then deleted - showed him blindfolded and with a bloodied face. Indian Prime Minister Narendra Modi is now holding a key meeting with security and intelligence chiefs to discuss the crisis. India has admitted that one of its fighter jets went down and that a pilot is missing - but we don't know how it will respond. Pakistan has said it is ready to sit down and talk. As we've reported, Pakistani airspace is currently closed to commercial flights. That's having an impact on airlines - which are having to avoid flying over the country. The picture below - from flight tracking website FlightRadar24 - shows what's happening. (Only one civilian airport - Karachi, in the south - is receiving incoming international flights that have been diverted). Dubai Airports has confirmed that flights are being affected. The United Arab Emirates is home to more than a million Pakistanis. Indian Prime Minister Narendra Modi has not publicly commented on the situation since Tuesday. All we've had officially from India since the Pakistani incursion and subsequent dogfight on Wednesday morning was a very short foreign ministry press statement. Pakistan has held a longer military press briefing and PM Imran Khan has addressed the nation (see posts below). But on Tuesday, the Indian PM - who will face an election by the end of May - assured Indians that he would "protect the motherland from all humiliation and threats". Mr Khan has repeatedly suggested that India's response to the incident that sparked tensions in the first place - a militant attack on Indian forces on 14 February - has been guided by concerns about the election. India has, of course, rejected that and says its neighbour provides safe haven to militants. Pakistani President Arif Alvi has described Prime Minister Imran Khan's statement (see posts below) as a "very appropriate, precise and compassionate message". Mr Alvi says that "Pakistan wants peace" and that "sanity should prevail". When Indian bombs fell on Pakistani territory on Tuesday morning, officials in Pakistan went to great lengths to show that the arsenal was released from outside Pakistani airspace. Wednesday's Pakistani strikes into Indian Kashmir show the military was under too much pressure and had to show an equivalent response. The dogfight this morning has sparked fears that India will now be under similar pressure to retaliate. Reports of a meeting of the National Command Authority that controls Pakistan’s nuclear arsenal have added to these fears. All civilian airports have been closed for traffic, except Karachi which is only receiving incoming international flights headed for other Pakistani cities. The situation in Pakistan-administered Kashmir is worse, with artillery shelling reported across the Line of Control (LoC). The authorities on the Pakistan side of Kashmir have declared a state of emergency in the region; educational institutions have been ordered to close, district authorities have set up emergency centres in their offices, and populations living close to the LoC have been asked to move to safer areas. Prime Minister Imran Khan has just called on India for talks and de-escalation, but a lot will depend on how India responds to this morning's developments. Will the US play a role? Analysts are asking what role outside powers, especially the United States, can play in defusing this crisis. Right now President Donald Trump is in Vietnam, where he will later meet North Korean leader Kim Jong-un to discuss denuclearisation. US Secretary of State Mike Pompeo has spoken with both Indian and Pakistani foreign ministers. "I expressed to both ministers that we encourage India and Pakistan to exercise restraint, and avoid escalation at any cost," he said in a statement. In his statement, Mr Khan also stressed that both Pakistan and India, each nuclear-armed, should be responsible. "What I want to say to India is this: it is of utmost importance that we use sense and wisdom. "All big wars are the result of miscalculations. Hitler never thought the war would go on for so many years. Americans never imagined that wars in Vietnam or Afghanistan would extend into decades. "My question is, with the kind of weapons that we both have, can we afford a miscalculation? If we let it happen, it will remain neither in my control nor [Indian PM] Narendra Modi’s." Imran Khan is defending Pakistan's retaliation following Tuesday's air strikes by India in Pakistani territory. He says that he offered to help India investigate the 14 February militant attack that saw dozens of Indian security personnel killed in Kashmir and triggered tensions. "We had told India that if you take unilateral action, we'll be forced to respond if you do anything. But India became judge, jury and executioner." The Pakistani leader says that two Indian MiG fighter jets were shot down. India earlier said it had only lost one plane. “We shot two of their MiGs. The pilots are with us," Mr Khan said. "But where do we go from here? I’m asking India. We must be responsible." Prime Minister Khan says in a televised address that Pakistan's morning strikes were not meant to cause casualties or damage. He said they were only meant to show Pakistan's "capability". Imran Khan has just started speaking about today's dramatic events. Rehman Malik, Pakistan's outspoken former interior minister, has also weighed into the debate to take a jibe at India's PM Narendra Modi and laud Pakistan's military.